The Ducati 250 Desmo was a nailed down design classic! Ducati began in Bologna, in 1926 - producing electrical parts. There is a certain irony in that - insomuch as Italian machines have usually been more noted for aesthetic perfection than precision practicality. Ducati's signature 'desmodromic' system saw engine valves closed by cams, rather than springs. The intent was to give finer, more direct control over valve operation ... which it did! For a brand so synonymous with styling, this was, for sure, a technical feather in Ducati's cap. The smallest - or most petite - of the 'Desmo Ducatis' was the 250. Of reduced capacity, it may have been - but, like its bigger siblings - the 250 was still blessed with a good turn of speed. Top speed was just short of the totemic 'ton'. Agility-wise, too, the 250 had a lot going for it. Weighing in at less than 300lb - and with finely-tuned suspension - its rubber side stayed resolutely glued to the tarmac. Nonetheless, clip-on 'bars, rear-set footrests, and a solo seat combined to coax riders to find the limits of such adhesion! The 250 Desmo was styled by Leo Tartarini. Eschewing extravagance, he drew the 250 with simple, straightforward lines. The bike had dynamism built-in - by dint of its 'racy' parts list. All in all, the 250 was as strong visually, as it was technically. Certainly, its desmodromic valve-gear took pride of place - in innovation terms, at least. But, the Ducati 250 Desmo possessed poise and purpose belying its size. 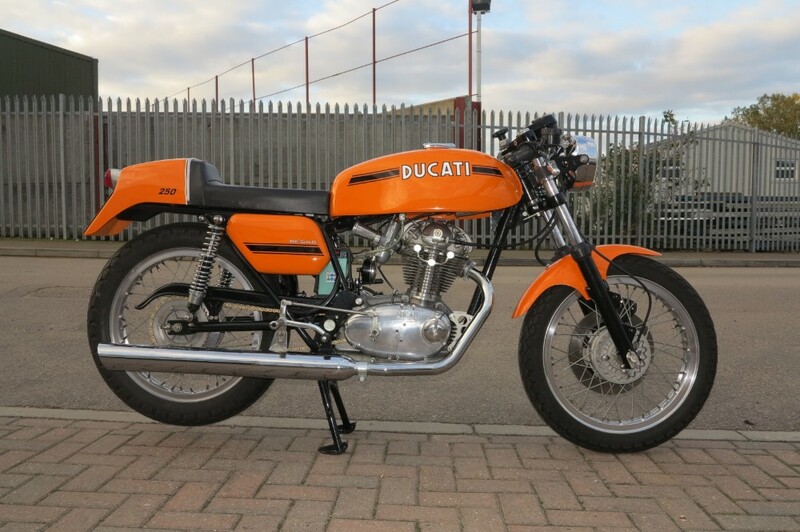 An impressive all-round package, this diminutive Ducati was much more than mere show.